Are you considering growing ginger in your garden or landscape? Here, you’ll find information on how to grow ginger, as well as tips on ginger plant care and how to combat common pests and diseases. The ginger family (Zingiberaceae) contains around 1,000 species of tropical perennial herbs. Some gingers are cultivated for their edible rhizomes, which are used for as both a medicine and a culinary spice. Other ginger plants, known as ornamental gingers, are grown primarily for their pleasing appearance. Leafy cane-like stems arise from rhizomes to form a plant 3 to 15 feet tall and 2 to 4 feet wide. Throughout the year, ginger plants produce stunning red blossoms that are often used in flower arrangements. When growing gingers, remember, they love moist, well-drained soil and partial shade. 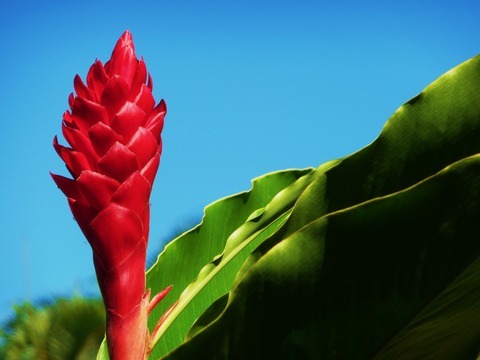 Red ginger (Alpinia purpurata) grows best under full sunlight. It also grows under partial sun and light shade. Pink cultivars suffer from a tip burn disorder that is lessened with 30 percent shade. Flower yield and rate of development depends on the amount of sunlight received by the plant. Ginger grows well in rich soil and in wet habitats, but it can grow in dry areas as well. Red ginger grows best in fertile, organically rich, moist, well drained soils with a pH range of 6.0 to 6.8. In poorly drained clay soils, chlorosis attributed to high manganese content may occur. Chlorosis due to high pH in calcareous soils is a common problem. Red ginger does better with supplemental irrigation if it is in an area with moderate rainfall. Keep soil moist. Red ginger requires 1 inch or more of water per week from irrigation during droughty periods. The best flower quality is achieved with generous irrigation. Use of a soaker hose would be great for this. Good flower quality is achieved with high amounts of irrigation. Red ginger requires water in excess of 1 inch per week during periods of drought stress. Water your ginger regularly. Never leave it in standing water, but keep the soil consistently moist. The only exception to this is an evergreen ginger in winter, which should be allowed to dry between watering. If your air is dry, mist your ginger daily. This will keep the leaves green and shiny, and your plant healthier overall. Repot ginger plants in the spring, at the beginning of their growing season. Gingers can be propagated by dividing the plant in the spring. Gingers do not need pruning, although you can pinch off blooms once they are finished. If your ginger plant is too large, divide it in spring and replant only the smaller part of the plant. Apply a complete fertilizer once a month. Flower production increases with increasing levels of nitrogen fertilizer. High levels of nitrogen fertilizer do not adversely affect the postharvest life of the flowers. Red ginger is not tolerant of temperatures below 50°F. At 41°F or less, the foliage and inflorescences die. It is shade tolerant but does not thrive in heavy shade. It does fine in light shade and tolerates moderate shade. Red ginger has low salt tolerance and is not drought tolerant. Provide protection from the wind and salt spray, as browning, tip burn, and discoloration may result. Red ginger is affected by several types of pest, disease, parasite and fungi. It is susceptible to 11 types of insect including two types of aphid, three types of scale insect and four types of mealybug. These pests are commonly controlled with insecticidal soaps, dips or sprays. Red ginger is also susceptible to several types of fungi including marasmius fungus and a variety of root rots. Most forms of root rot are ameliorated using proper drainage techniques and the removal of infected specimens. Red ginger is also affected by parasitic nematodes that target the roots of the plant. These pests are commonly combated using compost or manure tilled into the soil before planting. This tactic increases the growth of microbial organisms in the soil to combat the presence of these parasites. Field sanitation is part of good pest management for red ginger. Remove all mature flowers from the field regardless of marketability, so that they do not serve as hosts where pests can multiply. Use wide spacing when planting, and keep plants trimmed back to avoid overgrown fields that are difficult to spray. Wide spacing helps prevents easy spread of pests from plant to plant in the landscape. Alpinia gingers require well draining soil that you keep moist. They prefer humidity, partial sun and will tolerate some shade. Alpinia gingers respond well to a balanced water soluble fertilizer after they flower. To stimulate blooming in early spring, use a low-nitrogen commercial fertilizer just as the ginger plant begins to get flower buds. Insects and other pests should not be a problem for most ginger species, but their rhizomes can rot if they are left in standing water for long periods of time. Alpinia gingers respond well to pruning: this helps to control the size of the plant, as it can spread quickly and outgrow its pot. Some varieties of ginger, such as the beautiful blue ginger, can survive short frosts and will re-grow from their root systems if temperatures drop below freezing.